Hardwood flooring is an investment and it is important to take care of them properly to keep them beautiful. Luckily, today’s finishes make hardwood floors more water-resistant and easier to maintain than in the past. That’s not to say that you can wet mop your floor like tile but you can do some simple regular maintenance to keep your hardwood looking as good as new. Sweep your floor or use a dust mop daily. Kermans Flooring in Indianapolis offers micro fiber dusting mops for this purpose. A hardwood floor cleaner is useful in removing occasional scuffs or heel marks. Spray some cleaner on a cloth and lightly rub the stained area. Sticky spots can be cleaned with a damp towel or sponge. We carry and suggest Bona solutions for cleaning hardwood floors to our clients. 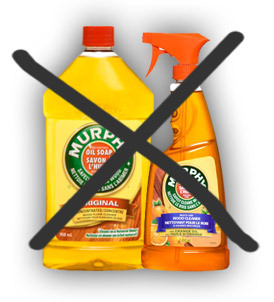 Do NOT use cleaning products (Murphy Oil Soap, Old English, wax, conditioner etc) each time you clean your floor; use water and cleaning products sparingly to increase the longevity and sheen of your final finish coat. Never wet-mop a wood floor. In all cases, use minimal water, because water causes deterioration of the wood itself as well as the finish. Avoid using mops or cloths that leave excessive water on the floor. Never let a spill of water dry on the floor. Never pour water directly onto the floor. Place floor mats or area rugs at each entryway to collect dirt and grit that might be tracked in. These tiny particles act like sandpaper and will scratch your floor. Be sure to avoid using rubber-backed or non-ventilated mats or rugs as they can damage your floor. Instead use mats or rugs made especially for hardwood floors and remember to shake them out regularly. If you have pets, keep their nails trimmed, they can and will scratch a wood floor. Come to the Kermans Flooring in Indianapolis showroom to get a hands-on feel for each hardwood style. What hardwood floor style is best for your home? Let our design consultants make a recommendation. We are a flooring store in Indianapolis, Indiana on 82nd Street, next to Bone Fish Grill. We offer hardwood flooring solutions, carpet, tile, and area rugs for Indianapolis, Carmel, Zionsville, Avon, Fishers, Greenwood, Geist, and other surrounding areas in Central Indiana.